Layout based on the GWR terminus of Newcastle Emlyn, with Parva added to make the name sound more 'countrified'. Built on boards donated by a member of the section, the layout slowly took shape. For simplicity the turntable was left out and a second line added to give a bit more variety, and the fiddle yard was added at right angles to the layout. Then after a year or so the second station Emlyn Magna was added in place of the fiddle yard, and the yard moved again at right angles to the layout, thus changing it from an 'L' shape to a 'U' shape. The new station has two through roads and a terminal road and loco stabling facilities. The station building is on the road above the track with steps down to the platforms (this new station may be left out of the layout, thus reverting back to the old shape). 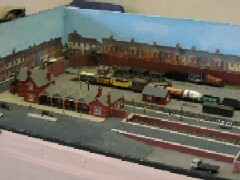 The station building at Emlyn Parva is a Kestrel kit, whilst the loco shed, goods shed and cattle dock are by Ratio. The bridge is scratch-built and the low relief backscene is printed sheet mounted on card to give a bit of depth. The members' own stock is used on the layout - regions used are GWR, LMS, MR and LNWR thus providing a very wide selection of stock. 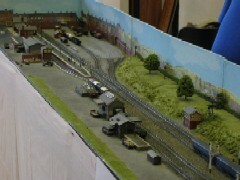 The layout is run at exhibitions to a set sequence. This is currently being remodelled with the incorporation of a fiddle yard at one end on a board that incorporates a turntable.